Dog owners just love to spoil their dogs with a variety of snacks, treats, and other goodies, right? We definitely think so, and if you've got a puppy of your own, dog subscription boxes might be something you're interested in. Today, we are bringing you our list of what we believe to be the top 10 dog subscription boxes on the market. Dog subscription boxes are assortments of treats, plush toys, grooming products, and other fun items that your furry friend will love! In this review, you will find all the information that you need in order to choose the best dog subscription box for your pup! Of those criteria, we take a look at the following 3 criteria in much greater detail because we believe they hold the most weight. Value for Cost: We believe that value for cost is a huge determining factor when rating subscription boxes. It is so important because we want to guarantee you that you are getting your money's worth. This is especially important because you could simply go to the store and purchase the items that are in your subscription box. Value for cost will help you determine if it is worth it for you to order a subscription box or not. We look at the lowest prices you could possibly be paying with each snack subscription box, the average price, and the cost of the in-store cost of each item. Customer Service: In order to receive a high rating, reliable customer service is a must. We take a deep look into the customer service that each subscription box provides. Customer service takes care of cancelling subscriptions, managing subscriptions, and addressing any questions or questions that you may have. Customer Reviews: Finally, we take a deep look into the customer perception of each subscription box. We make sure that we hear from the customer. We believe this is a key part of the rating process. Customer reviews can tell a lot about subscription boxes. You don't have to search the internet for them, because we take care of it for you! Using our rating system, we have put together a list of the top 10 best dog subscription boxes. We have sorted them in order of "best overall rating." BarkBox is a dog subscription box service that is designed to make your dog happier every month. You will receive a monthly box from BarkBox containing natural treats, chews, and several other original dogs toys. Your box will be delivered right to the doorstep of your home each month. Every new BarkBox has a special theme that we are certain your dog will love! 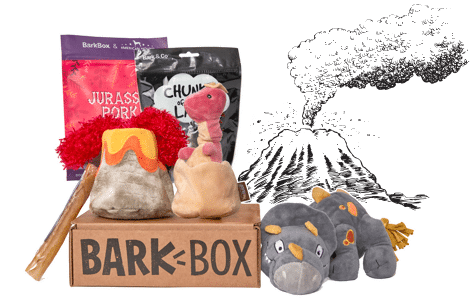 For example, past themes that BarkBox featured were Dogmas in the City, Chewrassic Bark (Jurrasic Par them), ThrowBark Thursday, and New York City. BarkBox offers high quality treats, chews, and original toys that are made with high regard to safety and health standards. They also have an amazing customer service team that is able to provide personalized attention to every customer. Need some more information on BarkBox? If so, check out our BarkBox review here, or click here to get started now! Who Should Try It: BarkBox is a great subscription service for owners of active, playful dogs. If you have a dog that loves plush toys and treats but gets tired of them quickly, then BarkBox is perfect for you. Deal: Join today and get your first box for $5 when you sign up for a 6-12 month subscription! BullyMake Box is a dog subscription box service that is great for dogs who are constantly running through their treats and toys. Instead of constantly making trips to the store so that you can replenish your dogs treats and toys, let BullyMake Box take care of everything for you. Every month, they will send a BullyMake Box right to the doorstep of your home! All of the treats that BullyMake Box includes conform to allergy and weight preferences, which makes them safe and practical for both small and big dogs. The boxes ship quickly to both US and global locations, so your location is never a problem. Finally, the boxes come with a guarantee, ensuring your satisfaction and providing assurance that problems will be taken care of as soon as possible. Sound like something your interested in? You can get started here, or read our BullyMake Box review here! Who Should Try It: BullyMake Box is great for dogs of all sizes who loves to chew. Furthermore, it is great for dogs who need tough treats. 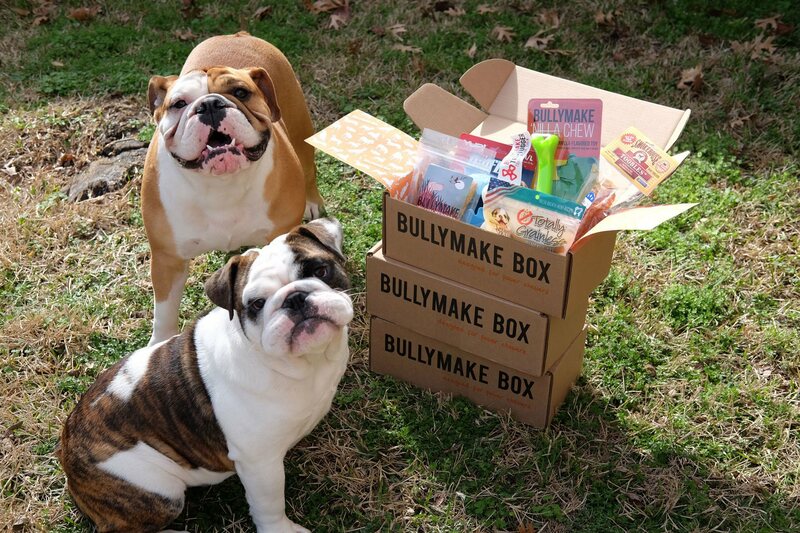 BullyMake Box might be exactly what you and your pup been looking for all along. Deal: Join today and get your first BullyMake Box the following Business Day! Pet Treater is a subscription box service that offers great assortments of treats, toys, accessories, and other great surprises to pet owners. They cater to both dogs and cats, but for now, we are going to take a look at what they offer for dogs. 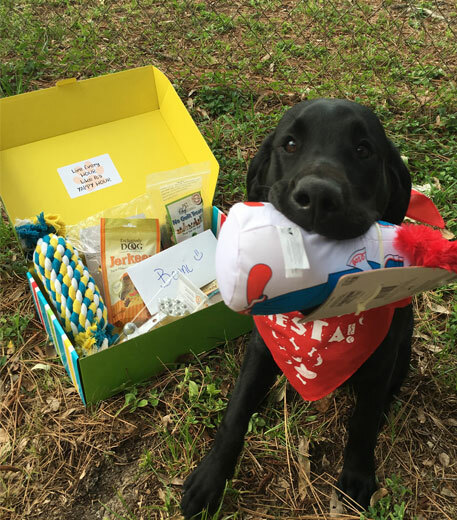 Pet Treater pays extra attention to the initial items that are sent, giving your first monthly box a “welcome package” feel. The majority of their food treats are made in Canada or the United States. Pet Treter's sign-up process is very simple, and it is reasonably priced. Finally, they have a great variety of of treats, toys, and other accessories that are presented in monthly themed boxes. Click here if you need some more information on Pet Treater. If not, you can get your first box here! Who Should Try It: If you are a pet owner who is looking to offer a variety of toys and treats for a pet in a convenient fashion, then Pet Treater may be exactly the service you are looking for. We suggest that you try this service for one month to decide for yourself if Pet Treater is right for you and your pet. If you are looking for a cat subscription box for your cat, we recommend checking out Rescue Box, a cat subscription box that donates food and vaccinations to shelter pets. Deals: Join today and get $5 off your first order when you use the code PT-5OFF at checkout! Pet Treater offers a bonus 20 percent off for the first month of a subscription by using the code “PT-20” at checkout. On the dog subscription page, we noted two alternate codes that can be used. “BARKICECREAM” will get you 2 free pints of dog ice cream in your first box, and “PT-5OFF” will get you five dollars off of your first box. 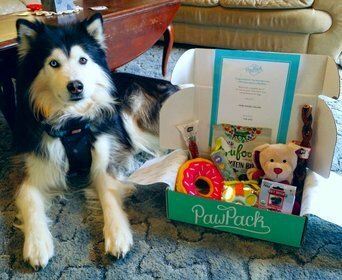 PupBox is a dog subscription box that provides you with and your dog with great products such as treats, teething toys, grooming accessories, and chew toys. They even include a training program that is develop and directed by Andrea Arden. Andrea Arden is a celebrity dog trainer on Animal Planet. All of the products that PupBox offers are "puppy tested and puppy approved." There are no edible items from overseas, and minimal ingredient treats. PupBox is a quality dog subscription box that we believe is worth your money! There are always plenty of goodies and options involved, and we love that they go the extra step to help you train your dog and include other accessories. You can even visit PupBox's PupShop to re-order and add your favorite products for your next shipment! Who Should Try It: PupBox is ideal for people who are looking to receive consistent assortments of new treats, toys, and chew for their dog! Also, if you are looking for some expert training help, you will receive a training program that is proven to work! 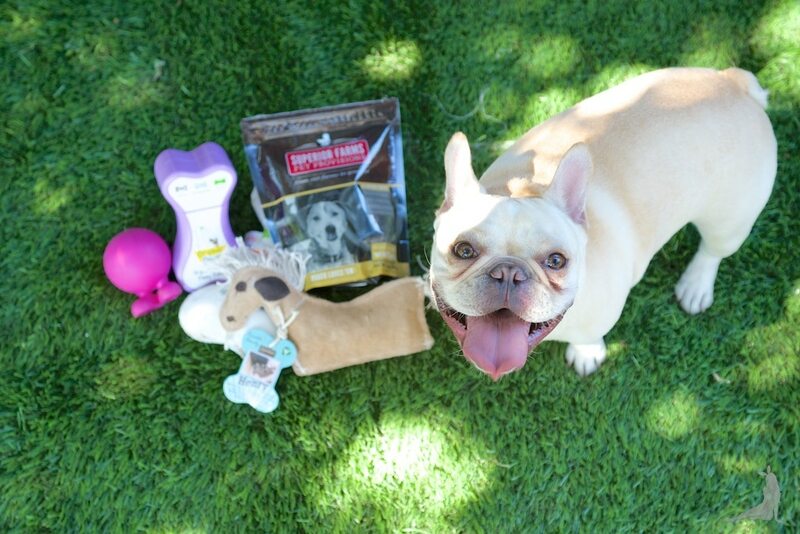 PupJoy is another dog subscription box service that we absolutely love! PupJoy offers both treats and toys, like many other dog subscription boxes, but PupJoy allows you to receive an entire box of all treats or all toys. A typical PupJoy box, however, includes two full size bags of treats that are made with limited ingredient treats, two new toys, and one bag of all natural chews. PupJoy also has a customer service team that is second to none. They advertise that their boxes are custom tailored to you and your dogs' wants and needs. It is truly a premier subscription dog box. They also have a 100% satisfaction policy, no contracts, and free shipping for all people residing in the Untied States. Who Should Try It: PupJoy is ideal for people who would are looking to receive a great supply of dog treats and toys. PupJoy's customer service is second-to-none, and all of their boxes have built in support for animal rescue. Every month, you know a little bit of the money you are paying for your box is going to help reduce the number of animals in shelters. Deal: All PupJoy members get $20 for friend referrals, $2 cashback on all purchases and renewals, and free shipping on any item. Pooch Perks is a dog subscription box service that offers different size monthly dog treats and toys. 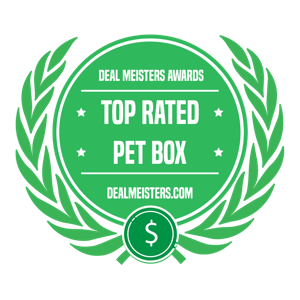 As a part of your monthly subscription, each month, Pooch Perks will ship a box that is designed to accommodate households with different or mixed sized dogs. Pooch Perks makes sure that each dog in your home has some options! You have the option to choose the "Popular Dog" box, or you can customize your pet box so that you can fit your dog's special needs. It is extremely helpful to customize your box if your dog has allergies or specific toy preferences. Boxes include 2 to 3 toys and two treats. The "toys only" box includes 3 toys, and the "treats only" box includes 3 treats and chicken stix. Who Should Try It: Pooch Perks is perfect for people who are looking to get their dogs fun assortments of toys and treats. If you have different sized dogs in your house, or dogs with specific preferences or allergies, Pooch Perks might be just what you are looking for! PawPack is one of the few dog subscription box services that offer all natural dog treats. They also offer fun plush toys and grooming products that your dog will love! When getting started with PawPack, you have to complete a pet profile, telling PawPack about your dog so that they can select the perfect assortment of goodies and various other options for your dog! According to the "PawPack Promise," they ensure "Durable toys. Clean nutrition. Unsurpassed quality. Sustainable wellness." PawPack's team of experts strive to source items that are organic and innovative. Their dog toys are hand selected with power chewers in mind, but they also understand that not all power chewing pups like the hard toys. It's a great little gift box for pet owners to surprise their pup with! Who Should Try It: If you are looking for all natural treats for your dog, Pawpack is the perfect dog subscription box for you! They have high quality products, and their customer service team is ready and willing to help you! So there you have it! Now that you have read our top 7 best dog subscription boxes, you now have enough information to pick the perfect dog subscription box that fits the needs of you and your dog! We don't believe you can go wrong with any of the monthly subscription boxes on our list, as they all provide a great value for cost! 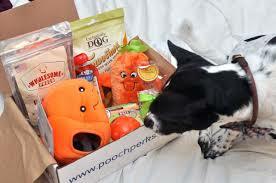 Above all else, we hope your pup enjoys his or her monthly subscription boxes and assortment of new treats and toys! Previous articleTasting Club Review – A Club For The Whisky Enthusiast? BarkBox offers such a great monthly subscription box for a very reasonable price. My dog gets so excited each time her box arrives. So far she has loved all the treats and toys. She especially loves the bones. Thanks BarbBox! Thanks for your feedback, Maryann! So glad to hear your dog is enjoying all the treats and toys, especially the bones. PawPak offers such a great selection of healthy all natural doggie treats. Their toys are very durable and my dog just loves getting new ones each month. I love watching him get so excited when the package arrives. Thanks, Elizabeth for your feedback! Really happy you’re a satisfied subscriber. 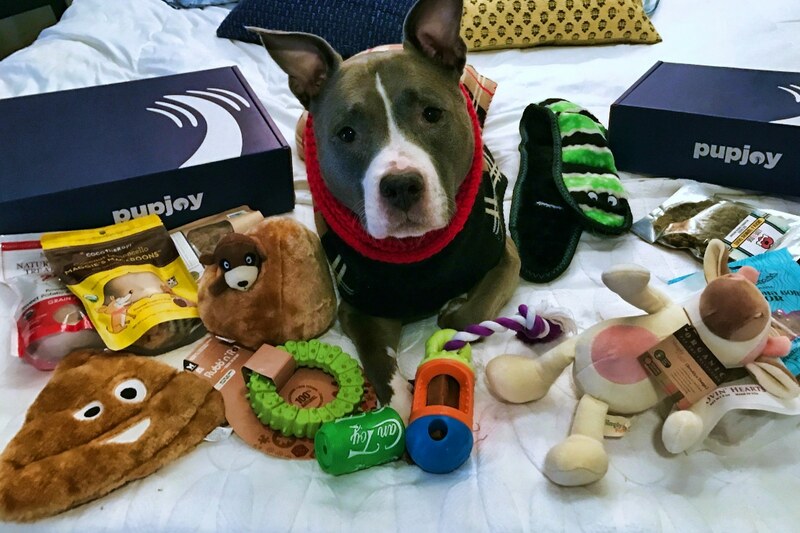 Erica Guffey Just received the first box from PupJoy and we absolutely love it. Love that you can customize it to just toys or treats. Seems like you can never get enough toys. Will definitely continue this subscription. Thanks for sharing with us, Erica! We really appreciate your feedback.glad to hear you’ll be continuing your subscription. I absolutely love ordering from PupJoy. You get full-size bags of treats in each box. The toys are very good quality. Every month my dog goes crazy with excitement when his box arrives. Thanks, PupJoy! Thanks, Pamela for your awesome feedback! Really happy to hear you and your dog love the PupJoy subscription. Pet Treater is by far my favorite monthly box subscription for my pets. I have two small dogs and they love their new toys and treats each month. They also throw something in there for me too so that’s a bonus. Would definitely recommend them to others. Thanks for sharing with us, Melissa! I’m glad to hear your dogs are enjoying their treats and toys each month. I absolutely love and recommend BarkBox for anyone looking for all-natural dog treats and chews. The toys are also very good quality. The price is lower than most other monthly subscriptions. Thanks for your feedback, Emma! I’m glad you love your BarkBox subscription. They are a very good price for all-natural treats and chews.